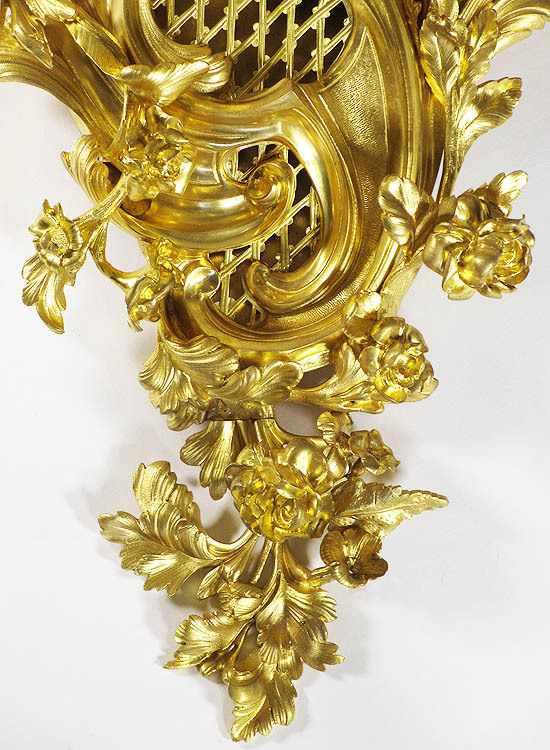 A Very Fine and Palatial French 19th Century Louis XV Style Gilt-Bronze Figural Cartel Clock by Lerolle Frères, the finely frame body with a circular face with Roman numerals, the center with a profile of King Louis XV and inscribed Lerolle Frères, behind a glass door, surmounted with floral scrolls, flowers, acanthus and an intricate lacing, crowned with a scrolled top and a seated putto holding a bundle of wheat and a sickle, emblematic of the harvesting. Circa: Paris, 1870-1880. 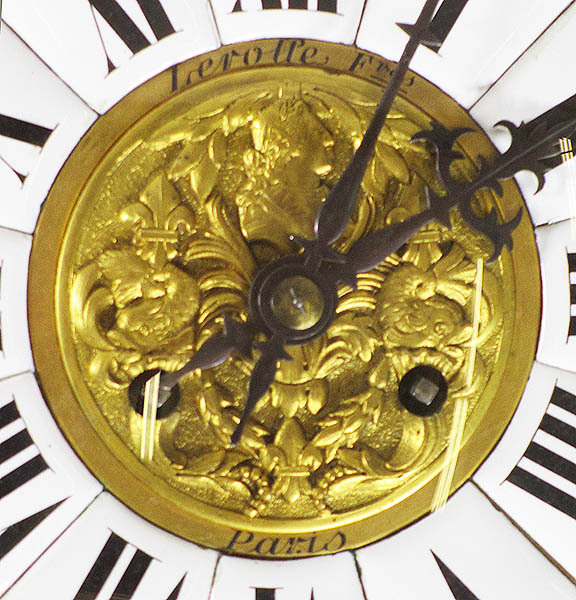 This superbly crafted Cartel Clock was created by the renowned Parisian fondeur, Lerolle Frères with premises at no. 1 rue du Foin et Chaussée-des-Minimies who produced all types of bronzes in the Renaissance, Louis XIII and Louis XIV styles. Established in 1836 after inheriting the family business the firm designated themselves Fournisseurs de la Cour de Sardaigne, referring to a silver medal granted to their father for a cheminée and console supplied to the King of Sardinia. 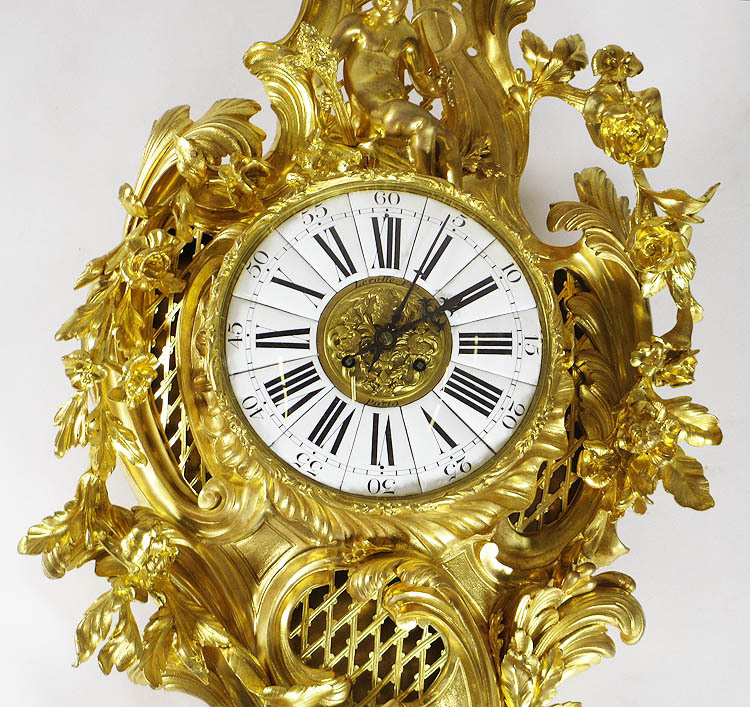 Lerolle exhibited ornamental clocks, garnitures, chandeliers and candelabras, predominantly gilt-bronze or silvered, at most of the international exhibitions held during the second half of the 19th century, London 1851, New York 1853, Paris 1855 where the firm obtained a médaille de 1re classe, London 1862 and Paris 1867 and 1878. The firm was fêted by critics for their luxury decorations by 'first-class artists, while modelling, moulding, chiselling and finish rank among the bronze-masters of Paris' (The Illustrated Catalogue of the Paris International Exhibition, 1878, p. 153). 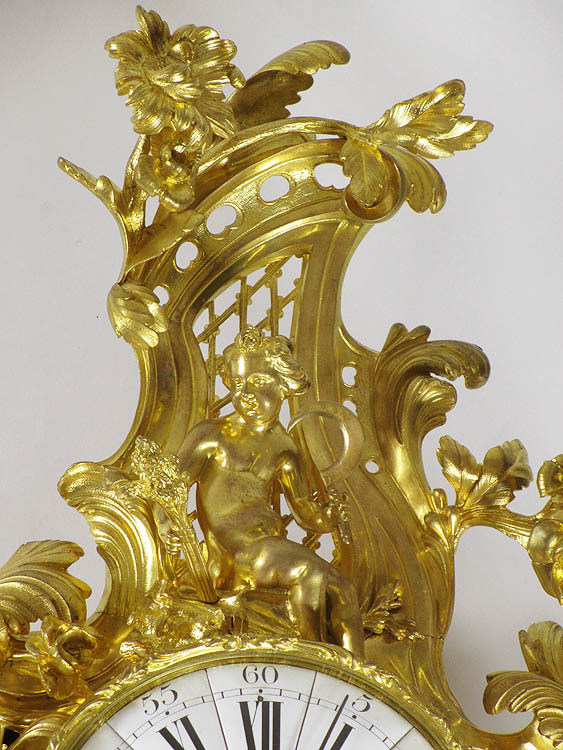 In 1862, Lerolle participated in the Exposition des Beaux Arts Appliqués à l'Industrie and the same year were manufacturing bronzes for the Maison S.A.I. le Prince Napoléon, and the l'Hôtel de la Commission Française. At least eighty percent of their production was exported; the South Kensington Museum, later the Victoria & Albert Museum, acquired a gilt bronze tripod depicting the three heads of Isis cast by Lerolle supporting a bowl made from marble from the Pyrenees (B. Metman, 'La petite sculpture au XIXe siècle Les èditeurs', Documents sur la sculpture française et Rèpertoire des fondeurs du XIXe siècle, p. 201).